57:38:625 DecodeThread I[ME]: HW\MediaEngine.cpp:87 FF:  is not implemented. Update your FFmpeg version to the newest one from Git. If the problem still occurs, it means that your file has a feature which has not been implemented. 57:38:625 DecodeThread I[ME]: HW\MediaEngine.cpp:87 FF: Sample rate index in program config element does not match the sample rate index configured by the container. 57:38:628 DecodeThread I[ME]: HW\MediaEngine.cpp:87 FF: Inconsistent channel configuration. 57:38:630 DecodeThread I[ME]: HW\MediaEngine.cpp:87 FF: No accelerated colorspace conversion found from yuv420p to rgba. It seems to think that the video has aac audio. I wonder if we're flushing wrong... maybe logging sceIo would help us understand if it's trying to play two different videos or just one? It then flushes, which we survive, and then flushes again, which we don't. Seems strange. 59:58:702 DecodeThread I[ME]: HW\MediaEngine.cpp:87 FF: No accelerated colorspace conversion found from yuv420p to rgba. Just gonna send the exe now, reuse the other files from v1.2.2-680-g0519b3ef7. v1.2.2-658-gce8d2bef5.zip - if only this fails, it's #8803. And it seems to use both Psmf and Mpeg. Okay so to confirm that even better, here's a build with #8803 reverted. We still want those changes for sure, but this will confirm if the latest version works without them. Again, just the exe - use with assets from v1.6.2 or the latest git build. I wonder what mpegLibVersion is being used here. Last build - this will show a message with the mpegLibVersion so there's no question. Maybe there's something funny happening here. Okay, so it's using the firmware version which should be the latest. It gets tricky if two different things broke it. We could try reverting 8803, 8867, 9014, and 9484. If it's all related to Mpeg, those should be the PRs that cause it. Want to try that or should I try to make a build? PS: Good to see you around. edit: That mean two different things broke it ? Hmm... you might have to try git submodule sync --recursive. 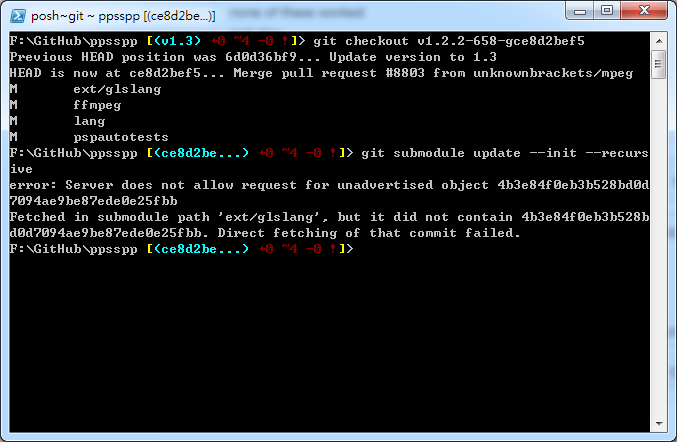 I think it was pointing to a different git repo then, and git submodule update doesn't change repos of submodules. Ah - that could even mean it broke earlier on then, just not consistently. 05:58:465 DecodeThread I[ME]: HW\MediaEngine.cpp:85 FF: No accelerated colorspace conversion found from yuv420p to rgba. Maybe this change is now truncating a frame (sometimes) at a ringbuffer boundary and it's not working properly or not providing more data the way we expect...? But in the current master,maybe I revert some wrong sum2012@6760c3d , video suddenly become black.